Two years ago, I moved from a city residence to a new suburb of Oklahoma City, on land which, until recently, was home to alfalfa fields, thoroughbred horses, and (apparently) all manner of wild creatures. I see foxes, mountain lions, hoot owls, and tarantulas on a regular basis. Unfortunately, I also see herds of hornworms. Last summer, my garden was infested with them. I didn't notice the fluorescent green, horned mammoths on my tomato and pepper plants until they were the diameter of a pencil and about two inches long. I only noticed that the leaves of my gorgeous plants looked as if they had been through a thrasher. Later in the year, however, the worms looked like caterpillars on steroids --- four inches long and the diameter of a skinny sausage. Initially, I removed the creatures from the plants, put them in a styrofoam cup with a tomato leaf snack, and placed them carefully in the trash barrel for a pleasant ride to the dump. When I ran out of styrofoam cups, I began a slinging ritual every morning. You know --- prying them loose from the plant with salad tongs and heaving them over the back fence. They would give me a plaintive look and hang onto the tomato branch for dear life. I worried that the impact on the other side of the fence might be giving them a concussion, so I decided to put the daily horde into paper bags and transport them down the road to an empty field. Understandably, this became a nuisance, so I decided that, since I had already done my bit to preserve the hornworm population for posterity, I would simply tug them from the plant (no mean feat), place them gently on the lawn, and cut them in half with a pair of worm-designated scissors. Did you know that half a worm functions in approximately the same way that a whole worm does? I found that I had to cut them again into fourths. Since they have faces and green jello guts, the whole process nearly gave me a coronary each morning. This year, I've decided to buy a product called Bt, a bacillus purported not to be toxic to humans or domestic animals, and spray the heck out of them. I may wipe out an entire generation of hornworms, but I'll justify it by being kinder to stink bugs and yellow jackets. If you're a skeptic who believes global warming is a hoax masterminded by governments to allow them to assess a carbon tax, you might want to visit my vegetable patch. The June-bearing strawberries began producing their luscious fruits the first week of May. It's going on June, and the Big Bell peppers are the size of golf balls---a full month ahead of their usual maturity date. Aphids, usually a curse to be reckoned with in summer heat, have been gnawing on my basil and oregano since April. Given that I probably have the only vegetable garden within a ten-mile radius of my home, it has become a smorgasbord for creatures who, in earlier years, foraged for snacks in the countryside. They've moved into the city---and they're famished. Rats are my personal favorites. By the way, if you wish to calculate rather accurately the number of yards of dirt required to refill a particular-sized rat burrow, take two times the diameter of the rat, multiplied by the number of rats in the burrow, divided by three, squared. Add an extra yard of dirt for ground settling, and you're back in business. Anyway, I've written this little rhyme to commemorate the creatures who are currently enjoying the fruits of my labors---and all those who have gone before. No condolences necessary. To lay eggs and have litters. Who dined well on the toads. 'Cause I truly am vexed. Do you think I'm next? Strawberries love me. I need only shake a finger and they do my bidding. I've never encountered a radish who didn't shower me with affection. But, my love affair with carrots has been rocky, to say the least. They behave nicely, even passionately, so long as the weather is temperate in spring and early summer, but by July, they proclaim that ours was really just a casual affair and I'd be wise to turn my attentions to a pepper or a squash. They're so fickle! They emerge from the Oklahoma clay looking warty, shrunken, uncarroty. I know I should grow them in raised beds with imported soil and compost but, aesthetically, raised beds don't suit the style of my garden. And, besides, if you give a veggie an inch, it'll ask for a mile. Pretty soon, the radishes and lettuces will be demanding raised beds and I'll have a garden full of wooden, caskety-looking things. Well, I'm not easily rebuffed by a mere carrot. There will be no defiant root veggies in my garden bed. This year, I'll bring out the big guns. I'll dig the soil deep (like to bedrock). I'll incorporate as much compost, manure, and other fluffy stuff as my back will allow. Warning to self: Don't incorporate coarse sand into Oklahoma clay unless I want to make bricks. I'll remove every rock from the soil, so help me God. Rocks make carrots grow crooked. I'll grow only short, fat, ball-type carrots, such as Chantenay, Parmex, or Thumbelina. I'll mulch heavily with compost (my favorite), shredded newspaper (not the pages with colored ink), or decomposed leaves from last fall. I'll thin mercilessly, to at least two inches apart in all directions. I'll remember that I've already used manure when preparing the soil, and carrots don't usually need additional fertilizers. I'll pray a lot and expect miracles. Just so you know: You absolutely cannot make carrot cake without carrots. Okay, so your Oklahoma garden has been tilled, fertilized, planted, and staked. You're sailing along on a garden breeze. And then, BAM! It's middle of May, and the hail comes, and the drenching rains, and the inevitable tornadoes. If you still have a house (or if it's reasonably intact), you find your tomato cages, which were careened into the next county, you scoop up the sloshy mud from the lawn and place it back into the garden beds, you re-fertilize, re-stake, and regain your composure. It's all back in order. And then, BAM! July comes with blistering heat, a parade of pests, and plant diseases heretofore unknown to mankind. So, here's what you do. You stiffen that already stiff upper lip, you plant tough crops (as many as possible with deep roots), you stake EVERYTHING like there's no tomorrow. You save all your disposable nursery containers and empty five-gallon paint pails. You keep a stock of mid-size boulders. Then, in the event of hail or high water, you overturn a pail over each plant, plunk a boulder on top, and you're good to go! Maybe. As to pests, you take no prisoners. Treat yourself to a daily stroll through the garden, hand-picking and destroying anything that creeps, crawls, slithers, or slimes its way near your precious plants. Leave the toads who have taken up residence in the strawberry patch, and who eat more harmful insects in a day than you can destroy in a month. Encourage worm-eating birds to visit the garden by installing feeders and baths. Consult with experts at your local nursery, who can recommend organic pesticides. Read every gardening book ever written so that you can differentiate between those pests which may harm your plants and those who have come to help. I garden in U.S. Dept. of Agriculture (USDA) Hardiness Zone 7a in Tornado Alley. Unless you garden in The Sahara, it doesn't get any worse than that! No matter. Adversity is, after all, a huge part of the fun of gardening. If it were easy, most of us wouldn't do it. It nurtures in us those much-coveted qualities of endurance, patience, and optimism which allow us to grow and thrive. And---there's that other thing. It affords us the pure ecstacy of eating a tomato which really tastes like a tomato. It was wonderful to see you at Galveston Bay on Saturday. As you may have heard, our trip back to Oklahoma in our motor coach on Monday was like a Peckinpaugh movie. Destruction and mayhem! There was an outbreak of thirty-seven tornadoes that day, three of which we encountered on the interstate highway, and one of which twisted its way through our neighborhood. Trees down. Roofs peeled back. Garden sheds, trampolines, and patio furniture wrapped around telephone poles. Two people died in that rash of storms, and over 100 persons were seriously or critically injured. Good news! We had only minor damage to roof and fencing---and my veggies were still upright. This past weekend I went to Galveston, TX, where I caught wind of this website. Actually it was my grandmother Kay who mentioned it. Just wanted to visit and see what "Hornswoggled by Hornworms" was all about. The hornworm story is hilarious. It was very descriptive. I could play it out in my head every step of the way. Having seen the beautiful garden she speaks of, the hostility towards the horned beasts is justified. I will return later to see how the battle between horticulturist and hornworm plays out. Lastly, I would like to say hello to the other family members that have posted. Herds of hornworms!!! I would have fainted. I only had to deal with 4 or 5 the whole season and they gave me the heeby-jeebies. I'm going to take your advice and try the Bt. Since all of my plants are in containers it would not affect ground water. BTW, your post was hilarious. I nearly fell out of my chair laughing. Would love to see pics of your garden. When I depart this earth, the word SQUEAMISH will surely be etched in my headstone. I can touch a toad (briefly) if there's a hot water faucet and a bottle of hand sanitizer very nearby. But, terrapins are another matter entirely. While driving down a dusty Oklahoma road one spring morning, I encountered two turtles carrying little signs saying, WILL WORK FOR FOOD. So, I took them home, turned them loose on my perfectly manicured lawn, and hoped for the best. They didn't disappoint! Those little guys worked the soil in my tomato patch like nobody's business. True, the tunnel they dug to China smack in the middle of my bed of prized roses WAS a bit much, but we must always reward hard work and perseverance. I rewarded them every morning with chopped boiled chicken, grated carrot, and a lettuce leaf or two, which I left on paper plates outside my kitchen door. Named Nip and Tuck, the terrapins ingratiated themselves to my family. After a few weeks, they began to follow me around the back yard, helping me tend the tomatoes and strawberries or simply keeping me company. Once, when I'd forgotten to serve up their breakfast, I heard a persistent scratch at the door, and there was Tuck, on his hind legs against the glass, reminding me. This became a daily ritual. I would purposely forget---and he would complain. I'm a firm proponent of equal pay for equal work, but I definitely got the better part of this deal. When I moved to my new home two years ago, I didn't have the heart to remove Nip and Tuck from their familiar surroundings. So, I left them with the family who purchased my home, along with instructions about meal planning for terrapins. In our house, salsa is its own food group! Thanks for the recipe. Celebrity tomatoes have been my favorites for many years. They're perfectly red and meaty, they're determinate (so the plants stay a manageable size), and they don't seem to mind Oklahoma's excessive heat and humidity. I also grow Sweet Hundreds and Sweet Millions every year---to toss into salads and to share with neighbors. Prolific, indestructible, and fun to eat out-of-hand as I garden. Absolutely nothing else tastes as good as a sun-warmed tomato! I've never had the success with my tomato plants that you have, so last season I finally wised up and listened to my "big sister"! I had experimented with "Big Boy", "Better Boy", "Heritage", and others but last year I was so pleasantly surprised to see such full, juicy, beautiful fruit. They have such a wonderful consistency and texture. I made the most delicious, mouth watering salsa from them, and gave it to many of our friends. I thought it would be fun to share the recipe. All sections of a large garlic pod, cleaned and chopped. Bring all the ingredients to a boil and simmer on medium heat for two hours. My eldest son, Mays, tells me that, even though Bacillus thuringiensis (Bt), if dusted or sprayed on tomato and pepper plants, has no ill effects to humans, it CAN travel through ground water to contaminate rivers and streams. Since I trust his knowledge, and since he grows the most wonderful vegetables this side of Eden, I guess it's back to the drawing board for me. No Bt! Even on the off chance that I might destroy all aquatic life in the western hemisphere, it isn't worth the risk. I do recall reading that a weekly dusting of the plants with ground red pepper (cayenne) is a passable deterrent. Even if it doesn't send the little buggers directly to their just rewards, I'm hoping they'll sneeze so hard it will knock them off my plants. How kind of you to take the time to visit my webpage. Yes, we all have our special talents---and yours is a talent for looking beautiful. Got your tan on yet? You are so funny and such a wonderful writer!!! I think that is a talent you and my mother share! I would LOVE to see this garden of which you speak! I was laughing out loud reading how you cut those hornswoggled boogers in half, and with that not doing the trick, snipping them yet again to ensure a complete death! I see you tried the humane method to no avail, so I certainly can't blame you for taking the snippers to them! Don't mess with my Aunt Kay's garden!!!! Keep up the great stories! I agree with Bill that you should certainly see where this writing "bug" could take you! You truly have a poetic soul. Not only that, but you can take one brussels sprout and a withered onion and turn them into haute cuisine! As I marvel at each budding flower. As they bless the crisp air with perfume. Have dusted them all with their wand. Through the rocks that are strewn in their path. And greeted each one with a bath. And be sure that "only God" knows. Though I'm fully aware that this is a blog about gardening, I'm desperate to talk about seashells and chemtrails. Since my garden is the vantage point from which I view these oddities, humor me for a moment and pretend it's relevant. I find it intriguing that tilling the soil in Oklahoma City, which is literally dead center of the United States and a gazillion miles from any ocean, turns up seashells. As a novice gardener, I imagined that the shells were fairy-tossed or that someone had emptied a gigantic aquarium onto my land. Turns out I live on what was once an inland sea. On a spring morning, when the wind seems just right and the sun warms my skin in a particular way, I close my eyes tight as a clamshell and I swear I hear the call of seabirds and the swoosh of dolphins past my chaise. And, then there's that other thing---the chemtrails. If you haven't heard of them, you need only check the web, keyword "chemtrails", where you'll encounter all manner of persons of questionable intellect droning on about their "sightings". That aside, I see them myself, and I'm mortified! I can't imagine that there's anything sinister afoot, as the afore-mentioned intellectually-challenged do, but here's my story, and I'm stickin' to it. White, unmarked planes dispense enormous quantities of chemicals into the sky which, at first glance, appear to be normal contrails, but which remain in the sky for hours and feather outward to form pseudo-clouds. Call me crazy, but on two occasions, I've witnessed these chemicals falling into my garden, covering the tomatoes, the roses, and my lawn with silky, fibrous strands which disintegrate when I touch them. I've attempted to capture them in a bottle, like fireflies, to no avail. Being of a certain age and reasonably sane, I should know what these are---but, admittedly, I'm baffled. Wait a minute! I nearly forgot. Once, while double-digging my rose bed, knee-deep in mooshy, red, Oklahoma clay, I upturned a rusted Colt 45 with a broken grip. Imagine the scenarios THAT provoked! My point is: As pure adventure, gardening rates right up there with exploring Venus or spelunking an ancient cave. Well, maybe not the Venus thing. Who would think the subject of Hornworms would be so interesting and funny!! You have made it both of these. I loved the entire article. As I've told you before, you are one of the few things that tie me to the earth and keep me sane. Well, moderately so. I wish you happy tomatoes and rosy roses. 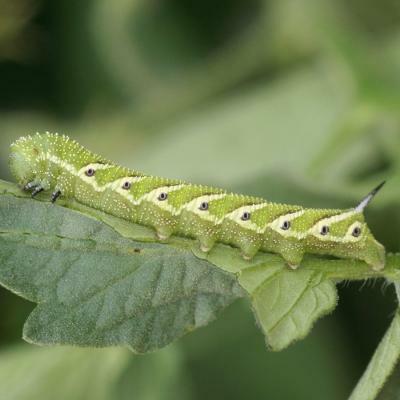 Your article on Hornworms is priceless. I've always admired your writing and the humor in which you compose. We have many things in common as you know, but this is one thing I hope I don't inherit. As of yet, I have no Hornworms. I will continue to follow your interesting blog. Kay, you had me on the edge of my seat, what a great tale of 'tongue in cheek' endurance - I love the way you wrote it. Here in the UK we don't have such monsters to contend with so all you folk over the 'pond' certainly have my sympathies. On a more serious note Kay, you certainly have an entertaining way of writing, you should take a look at my page 'Make Money From Your Passion' and consider creating your own website about what your passion is, like I have - not as difficult as you think may think with the kind of help given.